The foundation of who we are is built around delivering a remarkable client experience. With purpose and dedication, our experienced team will provide exemplary service and execute your vision to the highest standards. 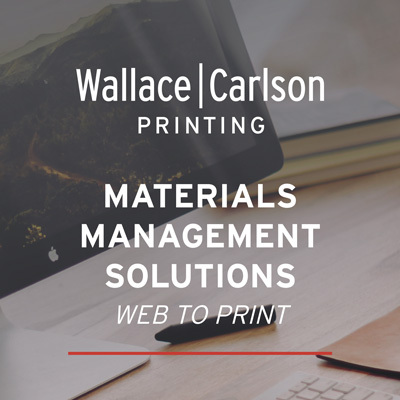 The Wallace Carlson story is about people all working towards a common goal – the creation and delivery of the finest printing and marketing services available anywhere. We are a woman-owned business with over 80 years of history, built on exceeding the expectations of organizations large and small. Specialists in marketing collateral, retail and product catalogs, packaging and direct mail. With a flat organizational chart and 24 hour staffing we deliver the quality, speed and efficiency to meet your project’s needs. WCP offers sheet-fed H-UV printing on a wide variety of paper and plastic substrates. 1 to 8 color printing with perfecting capabilities increase throughput and turn-times. Specialty coating options include aqueous, UV and varnishes, using combinations and custom design techniques to create one of a kind special effects. Bundling options from Palamides paper banding to high-speed shrink-wrap lines. Our central distribution point helps to meet critical in-home dates. Digital department is comprised of 2 Konica Minolta color print engines and 1 B/W engine. Saddle-stitch or perfect-binding inline.